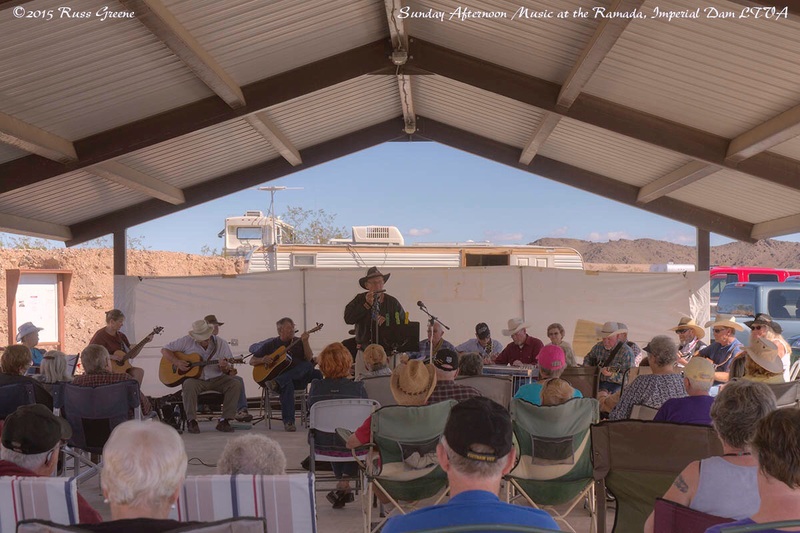 Sundays at 1:30 P.M. is music time at the Ramada at Imperial Dam LTVA. Grab your chair and head on down. Bring your instrument if you care to. Sundays here at the Imperial Dam LTVA is music day at the ramada. That’s what they call the open sided shelter just ’round the bend from South Mesa and up the road from The Gravel Pit, two of the camping areas here. Festivities start at 1:30 P.M. I arrived a little late and things were already in full swing… perhaps I should say full country because mostly that’s what was played and country don’t swing. Not that I have anything against country music, mind you. I don’t. I have quite a bit of it in my music library and I enjoy listening to it. I like the stories that are told. It’s not frenetic and you can hear the words unlike so much rock and pop. The musicianship on some of it is second to none and I love listening to the twang of the Fender Telecaster guitar and the melodic glissandos of the pedal steel guitar, sometimes called Hawaiian guitar. On long drives out in the middle of nowhere I’ve been known to put on some country music, sing along and cry while drivin’ down that long lonesome road. I didn’t know what to expect at the ramada. What I found was an audience of maybe 75 people and a group of musicians almost as large. OK, well, there weren’t really that many musicians, but there were at least 15, mostly sporting guitars, but there were a couple bass guitars, a dulcimer, a harmonica and a mandolin. I don’t know how things are organized other than that this is all put together by “citizens” of the LTVA, mostly senior citizens I might add. I hung around the ramada for an hour or so enjoying the music and every bit as much the fact that all these folks had come together for the afternoon just for the fun of it. I sang some harmonies to myself and swayed to the soft country sounds. As to the quality of the music itself? It just didn’t matter somehow, I think because it was really about folks getting together to have a good time.